When I was a kid, I always ate the same thing for lunch: a cheese sandwich on sourdough bread with butter, not mayo, carrots, a juice box, and a cookie. Can you guess which of the items was my favorite? If you guessed cookie, you’d be right. I always wanted dessert after lunch, and I still do! You all know how much I love dessert. I mean…I have a baking blog. It’s kind of obvious. No matter how hard I try to skip dessert, I always give in to my cravings, one way or another. And, like long ago in the school lunchroom, I crave dessert even after lunch. So, while I post tons of not-so-healthy desserts I try to limit my intake of those and mix in some lower-sugar and reduced calorie desserts. You know, so I can eat them more often. Like after lunch and dinner! Something I love to make that is lower in calories and fat is cheesecake. I know, it seems like that wouldn’t be possible, right? But it’s really so easy to make a no-bake cheesecake that’s a little more guilt-free than regular. Low-fat cream cheese and fat-free whipped topping cut the calories in these cheesecakes drastically, even though they have real sugar in them. 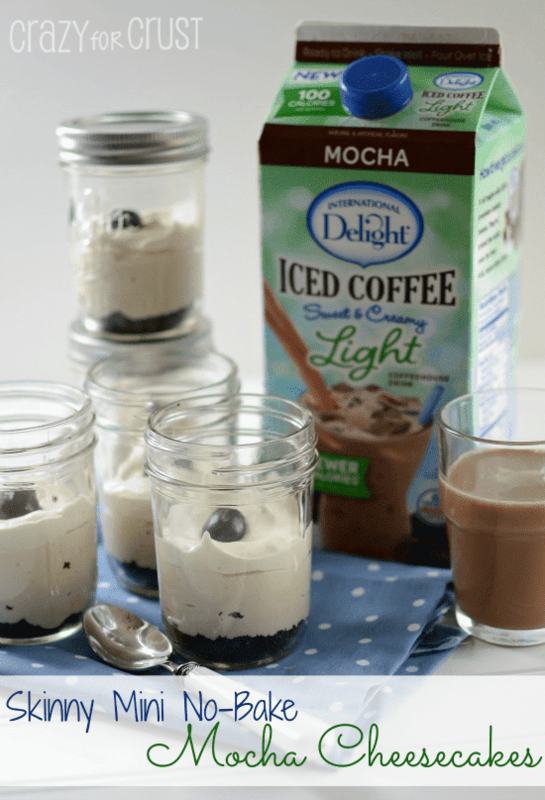 But really, my absolute favorite part of these Skinni No-Bake Mocha Cheesecakes is the mocha. Because I’m a girl who loves her coffee! You’ve heard of International Delight, right? They make those yummy coffee creamers. But did you know they also make Iced Coffee? I’d never had International Delight Iced Coffee before, but when I heard they had a Light Iced Coffee version, I was so stoked. There is nothing I like more at 2pm than a caffeine jolt. As the weather warms up I will become addicted to iced coffee again, and the fact that I can drink a light version is awesome. Plus, by drinking this at home I save a ton of money by not going to a coffee house and buying my afternoon pick-me-up. 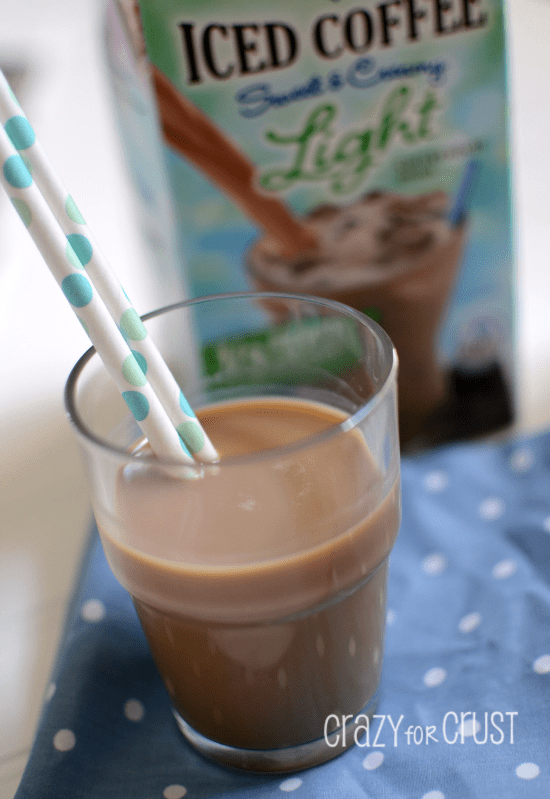 Did I mention that a serving of this International Delight Light Iced Coffee has only 100 calories? And that this Mocha flavor totally tastes like chocolate milk? Seriously! I was so torn when trying to decide between the Vanilla and Mocha version at Walmart last week. I finally decided on the Mocha because, well. It’s chocolate! Besides my love of desserts, I’m sure you know my love of pie. I am addicted to it! If I can give something a crust, I’m going too. As much as I love lower-calorie desserts, I love them more if they have a crust. Especially when the crust reduced fat too, which is another delicious thing about these Mocha Cheesecakes. These skinny cheesecakes have a reduced-fat Oreo crust, made with coconut oil instead of butter. I’m always hearing so many good things about coconut oil and I’m trying to use it more in my desserts. The coconut oil mixes well with the cookie crumbs, and hardens right up in the refrigerator without any crumbling, since that’s the nature of the oil. 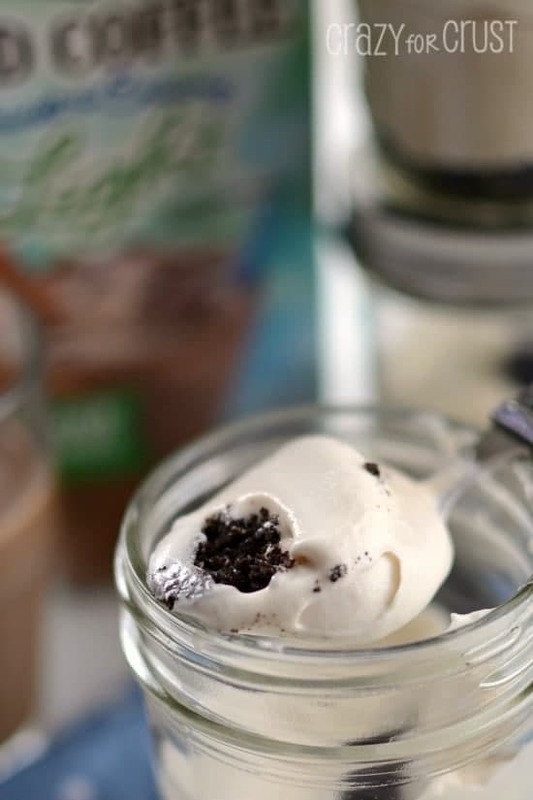 The coconut flavor pairs really well with the chocolate and the mocha flavors. So yeah…I need to get dessert out of my house. 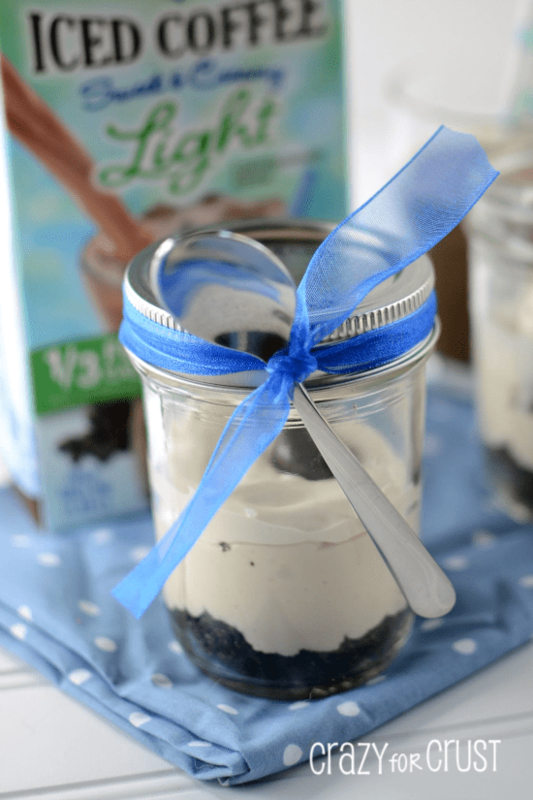 Putting these cheesecakes in jars make them great gifts. Attach a spoon and pass them out at school pick-up. You’ll be the most loved mom there! 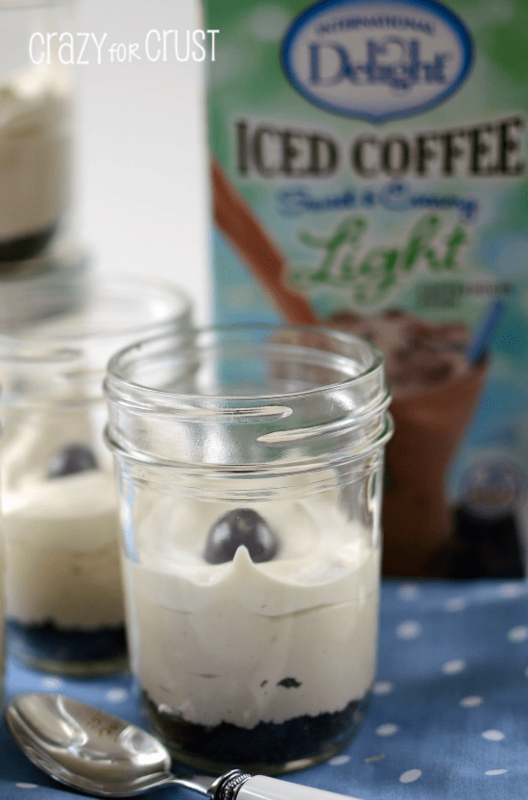 What are you going to make with your International Delight Light Iced Coffee? Click here for a coupon so you can try it yourself! Crush sandwich cookies in a food processor. Place in a small bowl. Add coconut oil and stir with a fork. If your coconut oil is hard, microwave it for 15-30 seconds so you can scoop it. Beat cream cheese in a large bowl with a hand mixer until smooth. Mix in International Delight and sugar. Stir in 2 cups of whipped topping. Equally divide among jars or glasses. Stir 1/2 tablespoon International Delight into the remaining whipped topping. Equally divide among jars and top with a chocolate covered espresso bean. Chill for one hour before serving. Store in refrigerator. I am a member of the Collective Bias® Social Fabric® Community. This shop has been compensated as part of a social shopper insights study for Collective Bias® and WhiteWave #CBias #SocialFabric. All opinions are 100% my own. See my Google+ story here. Would I be able to do it just by using instant coffee & water? Is there another option for the coconut oil?For someone with a nut allergy? You can use butter or light butter instead! I’m dying because my 60’s kitchen is being updated and I can’t make these NOW!!! I don’t know how you come up with all these Delish ideas but keep ’em coming. My friends and family love you for it! BTW in the Midwest they sell ID Light at Targets and all Dillons. I’m so jealous your kitchen is being redone! How fun!!! Thanks so much Julie!